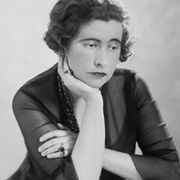 Although Violet Trefusis had some critical acclaim as a novelist in her own day, she's best known today as the passionate lover of Vita Sackville-West. She begged Vita to elope with her, leaving their husbands and families behind, so they could live openly together, but Vita preferred a more socially acceptable lifestyle. Much of Violet's writing, some in English, some in French, was unpublished at her death; Virago Press brought out two of her novels. In 1947, she inherited from her mother Alice Keppel the Italian villa L'Ombrellino, near Florence, where she lived for the rest of her life. Violet Trefusis is currently considered a "single author." If one or more works are by a distinct, homonymous authors, go ahead and split the author. Violet Trefusis is composed of 5 names. You can examine and separate out names.